O excellent Doctor, light of the holy Church, blessed Peter, lover of the divine law, pray to the Son of God for us. O God, who by thy divine providence didst ordain that blessed Peter should be foreshown by heaven, and chosen as an excellent teacher to govern and instruct thy Church; grant, we beseech thee, that he who taught us the true way to life, whilst here on earth, may now intercede for us in heaven. Through our Lord Jesus Christ, thy Son, who liveth and reigneth with thee, in the unity of the Holy Ghost, God, world without end. Amen. The same divine Providence, which would not that the Church should be deprived of the consolation of keeping, during Advent, the feast of some of the Apostles, who announced to the Gentiles the coming of the Messias, has also willed that the holy Doctors, who defended the true Faith against heretics, should be represented in this important season of the Catholic Year. Two of them, St. Ambrose and St. Peter Chrysologus, shine as two brilliant stars in the firmament of the Church during Advent. It is worthy of note, that both of them were the zealous avengers of that Son of God whom we are preparing to receive. The first was the valiant opponent of the Arians, whose impious doctrine taught that Jesus, the object of our hopes, is merely a creature and not God; the second was the adversary of Eutyches, whose sacrilegious system robs the Incarnation of the Son of God of all its glory, by asserting that, in this mystery, the human nature was absorbed by the divinity. It is this second Doctor, the holy Bishop of Ravenna, that we are to honour to-day. His pastoral eloquence gained for him a great reputation, and a great number of his Sermons have been handed down to us. In almost every page, we find passages of the most exquisite beauty, though we also occasionally meet with indications of the decay of literature, which began in the fifth century. The mystery of the Incarnation is a frequent subject of the Saint's Sermons, and he always speaks upon it with a precision and enthusiasm, which show his learning and piety. His veneration and love towards Mary, the Mother of God, who, in that very age, had triumphed over her enemies by the decree of the Council of Ephesus, inspire him with thoughts and language which are extremely fine. Let us take a passage from the Sermon on the Annunciation. “God sends to the Virgin an Angelic Messenger, who, whilst he brings grace, gives her the intrusted pledge, and receives hers. Then does Gabriel return with Mary's plighted troth. But, before ascending to heaven, there to tell the consent promised him by the Virgin, he delivers to her the gifts due to her virtues. Swiftly does this Ambassador fly to the Spouse, that he might assert God's claim to her as his own. Gabriel takes her not from Joseph, but he restores her to Christ, to whom she was espoused when she was first formed in the womb. Christ, therefore, did but take his own, when he thus made Mary his Spouse. It is not a separation that he thus produces, but a union to himself of his own creature by becoming Incarnate in her womb. Let us now listen to our holy Mother the Church, who thus speaks of our Saint. Peter, surnamed, for his golden eloquence, Chrysologus, was born at Forum Cornelii (Imola) in Ӕmilia, of respectable parents. Turning his mind to religion from his childhood, he put himself under Cornelius, the Bishop of that city, who was a Roman. In a short while, he made such progress in learning and holiness of life, that, in due time, the Bishop ordained him Deacon. Not long after, it happened that the Archbishop of Ravenna having died, the inhabitants of that city sent, as usual, to Rome the successor, they had elected, that this election might be confirmed by the holy Pope Sixtus the Third. Cornelius, who was also sent in company with the deputies of Ravenna, took with him the young Deacon. Meanwhile, the Apostle St. Peter, and the holy Martyr Apollinaris, appeared to the Roman Pontiff in his sleep. They stood with the young levite between them, and ordered the Pontiff to create him, and none other, as Archbishop of Ravenna. The Pontiff, therefore, no sooner saw Peter, than he recognised him as the one chosen by God; and rejecting the one presented to him, he appointed Peter to the Metropolitan Church of that city, in the year of our Lord 433. At first, the deputies from Ravenna were dissatisfied at this decision of the Pope; but, having been told of the vision, they readily acquiesced to the divine will, and received the new Archbishop with the greatest reverence. Peter, therefore, being, though reluctant, consecrated Archbishop, was conducted to Ravenna, where he was received with the greatest joy by the Emperor Valentinian, and Galla Placidia the Emperor's mother, and the whole people. On his part, he told them that he asked of them but this, that since he had not refused this great burden for their salvation's sake, they would make it their study to follow his counsels, and to obey the commandments of God. He then buried in the city the bodies of two Saints, after having embalmed them with the most precious perfumes; Barbatian, a Priest, was one; and the other, Germanus, Bishop of Auxerre, whose cowl and hair-shirt he claimed as his own inheritance. He ordained Projectus and Marcellinus Bishops. In the town of Classis he erected a fountain of an incredible size, and built some magnificent churches in honour of several Saints, of Saint Andrew among the rest. The people had a custom of assisting at certain games, on the first day of January, which consisted of theatrical performances and dances; the Saint repressed these by the severity with which he preached against them. One of his expressions deserves to be handed down: He that would play with the devil, can never enjoy the company of Jesus. At the command of Pope St. Leo the First, he wrote to the Council of Chalcedon against the heresy of Eutyches. He answered Eutyches himself by another epistle, which has been added to the Acts of that same Council in the new editions, and has been inserted in the Ecclesiastical Annals. Another account of St. Peter Chrysologus. St. Peter was a native of Imola, anciently called Forum Cornelii, a town in the ecclesiastical state, near Ravenna. He was taught the sacred sciences, and ordained deacon by Cornelius, bishop of that city, of whom he always speaks with veneration, and the utmost gratitude. He calls him his father, and tells us, that in his whole conduct all virtues shone forth, and that by the bright lustre of his great actions he was known to the whole world. Under his prudent direction our saint was formed to perfect virtue from his youth by the exercises of an interior life, and understood that to command his passions and govern himself was true greatness, and the only means of learning to put on the spirit of Christ. For by the oracle of truth we are assured that to bear well an injury is something far more heroic than to vanquish nations, and when the noon-day light shall break in upon us, and dispel the darkness with which we are at present encompassed, we shall most clearly see that the least act of perfect meekness, humility, resignation, or patience, is of greater value than the gaining of millions of worlds. This is the most glorious triumph by which God is honoured in us, and a soul enjoys interior peace, and his holy grace; all her affections being regulated by, and subjected to his will in all things. This domestic victory is something too great to be obtained without earnestness, and the difficulties which stand in the way are not to be vanquished or removed but by constant watchfulness and application. 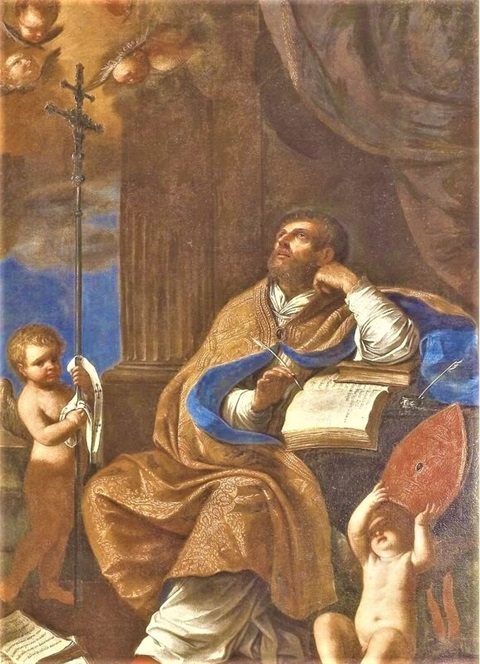 The more easily to accomplish this great and arduous work of subduing and regulating his passions, and forming the spirit of Christ in his soul, he embraced a monastic state, and had served God in it with great fervour and simplicity for some time, when he was placed in the archiepiscopal see of Ravenna. The Archbishop John dying about the year 430, the clergy of that church, with the people, chose a successor, and entreated the Bishop of Imola to go at the head of their deputies to Rome to obtain the confirmation of Pope Sixtus III. Cornelius took with him his deacon Peter, and the pope (who, according to the historian of Ravenna, had been commanded so to do by a vision the foregoing night) refused to ratify the election already made, and proposed Peter as the person designed by heaven for that post: in which, after some opposition, the deputies acquiesced. Our saint, after receiving the episcopal consecration, was conducted to Ravenna, and there received with extraordinary joy, the Emperor Valentinian III and his mother, Galla Placidia, then residing in that city. The holy bishop extenuated his body by fasting, and offered his tears to God for the sins of his people, whom he never ceased to teach no less by example than by words. When he entered on his charge, he found large remains of pagan superstition in his diocess, and several abuses had crept in among the faithful in several parts: but the total extirpation of the former, and the reformation of the latter, were the fruit of the holy pastor's zealous labours. The town of Classis, situate on the coast, was then the port of Ravenna, from which it was three miles distant: St. Peter built there a fountain near the great church; also St. Andrew's monastery. He employed an extensive charity and unwearied vigilance in favour of his flock, which he fed assiduously with the bread of life, the word of God. We have a hundred and seventy-six of his discourses still extant, collected by Felix, Archbishop of Ravenna, in 708. They are all very short; for he was afraid of fatiguing the attention of his hearers. He joins great elegance with extreme brevity. His style has nothing swelling or forced, though it is made up of short sentences or phrases, which have a natural connexion together: the words are very fit, simple, and natural, and the descriptions easy and clear. Among the remains of heathenish superstition, which he laboured to extirpate, he reckons the riotous manner of celebrating the New-year's day; of which he says, “He who will divert himself with the devil, can never reign with Christ.” It appears that he often preached in presence of the emperor and of the catholic Empress Placidia, mother of three children, Valenttinian III, Placidia, and Eudocia. He says that the episcopal see of Ravenna had been lately raised to the metropolitical dignity by the pope, and by the favour of a Christian prince. For though Ravenna had been long the metropolis of the Flaminian province or vicariat, the bishop continued suffragan to the Archbishop of Milan, till about the time that St. Peter Chrysologus was exalted to this dignity. Eutyches, the heresiarch, having been condemned by St. Flavian, addressed a circular letter to the most distinguished prelates in the church in his own justification. Our saint, in the answer which he sent him, told him that he had read his letter with sorrow: for, if the peace of the church causes joy in heaven, divisions ought to beget sadness and grief; that the mystery of the incarnation, though inexplicable, is delivered to us by the divine law, and to be believed in the simplicity of faith. He, therefore, exhorted him to acquiesce, not to dispute, having before his eye the rocks upon which Origen, Nestorius, and others had split, by taking that method. In 448, our saint received St. Germanus of Auxerre with great honour at Ravenna, and, after his death, esteemed it no small happiness to inherit his cowl and hair shirt. He did not long survive: for, in 452, when Attila approached Ravenna, John, St. Peter's successor, held his see, and went out to meet him. The saint being forewarned of his approaching death, returned to Imola, his own country, and there gave to the church of St. Cassian, a golden crown set with jewels, a gold cup, and a silver paten, preserved to this day with great reverence, and famed for miracles. Peter died at Imola, probably on the 2nd of December, 450, and was buried there in St. Cassian's church. The greatest part of his relics are preserved there; but one arm is kept in a rich case at Ravenna. Learning is recommended by reason, authority, and the example of the saints, and, next to virtue is doubtless the greatest improvement of the human mind and instrument of piety and religion. By it the nobleman is qualified for the superior rank he holds among men, is made capable of directing himself and others, is drawn off from sotting, debauchery, and idleness, possesses the art of filling most usefully and agreeably all his vacant hours, and acquires a relish for the pleasure of true rational knowledge, than which man can enjoy no greater or more noble, except those which piety and virtue infuse. By exercise and application the memory and other powers of the soul are perfected, the understanding is furnished with true ideas and a just way of thinking, and the judgment acquires true justice and taste. In a pastor of souls, and minister of religion, how essential the qualification of a consummate skill in sacred learning is, it is needless to show, the infinite obligations of that charge making it manifest to all men. How grievous, then, is the crime of those who are engaged in this state, yet idly throw away the time they owe to the study of the sacred writings, to holy meditation, and application to the science of morality and the pulpit? Also read – December 4, 2018: St. Barbara, Virgin and Martyr. St. Peter Chrysologus, pray for us.